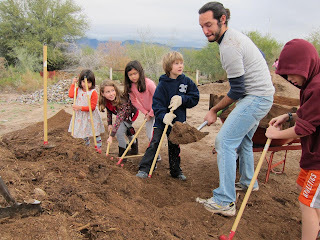 Kids Love Getting Dirty, So Let Them! It is no secret that kids like to get dirty. It is also no secret that playing outdoors and encouraging children to become comfortable with nature is an important part of a healthy and balanced life. In the last 20 years children have been spending less and less time outdoors, with most only spending on average 30 minutes a day outside, while spending up to seven hours in front of electronics or screens. It’s no wonder child obesity rates have doubled in the last 20 years. Science also shows an increase in ADHD and depression in kids since the 80s and 90s. Take playing outdoors to the next step and get them involved in gardening. From creating their own compost from food waste to applying needed nutrients and microbes weekly, kids will learn valuable lessons such as where their food comes from, patience, and responsibility. They may even enjoy eating that broccoli without complaint knowing it was something they grew. The first step is composting. Composting is a vital element in successful gardening. When done properly, compost can enhance your soil structure, provide nutrients to the soil that may have been depleted, and provide a healthy microbial community needed for plant growth. The Bokashi Food Waste recycling system is a simple and mess-free method perfect for young children to turn their normally wasted food such as meat, dairy, vegetables, fruits and garden waste into nutrients that can be added to their garden soil in just one to two weeks. Compost is a great way to feed other organisms in the soil such as worms, which are vital to a healthy soil. After you have a garden bed with the nutrient-rich compost, allow the kids to pick out season-appropriate seeds or transplants and let them get their hands dirty. To get the most out of your garden and to teach kids about the importance of microorganisms in the soil and environment around them, add EM-1®. In addition to fertilizer, mix 1oz of EM-1® per 1 gallon of water and apply to the composted soil if you planted seeds or both the soil and foliage if using transplants, and continue once a week until harvest for added soil and plant health. EM-1® is simply a probiotic for the soil and completely safe and non-toxic for kids to handle. EM-1® supports the growth of important organisms such as mycchorrizae, earth worms, and insects already in the soil. For a fun learning experiment have the kids treat only half the garden with EM-1® and keep the other untreated. Have them make note of the differences they notice such as greener foliage, greater yield and better tasting and longer lasting vegetables in the treated half.